Check out the work that Character Coach Parker Schenecker did at Georgia Military College this week! Read the press release from GMC below. Each year the student athletes at GMC are taken through a week by week TotalCourage Character Development program by their coaches in each sport. Three times a year there will be a guest speaker that will come in and enhance what is being taught in the program through their life experiences. The GMC Athletic Department had the pleasure of hosting retired COL Parker Schenecker as their speaker today. Before joining TotalCourage as a Character Coach, Parker Schenecker served as Vice President of Programs for because I said I would – a nonprofit social movement dedicated to the betterment of humanity through character development and education. As a Senior Leader and Strategist in the United States Intelligence Community, Colonel Schenecker was directly responsible for support to the US defense and counter-terrorism efforts in the Middle East. He finished his 27-year Army career at United States Central Command in Tampa, Florida with multiple combat tours in Iraq and Afghanistan and various other deployments to the Middle East. He has had the great fortune to work with and lead the best people America has to offer; individuals who made a solemn promise to support and defend the Constitution of the United States and volunteer to put their lives on hold and put themselves at risk in defense of freedom and our way of life. He has numerous US and foreign defense service awards and recognitions, including the Defense Superior Service Medal, the third highest recognition from the Department of Defense and the German Service Cross in Silver. After retiring from the Army in 2011, he became a Department of Defense Civilian employee and continued to take pride in his service to country both in the US and on various deployments in the Middle East. However, his greatest joy has always been his children and their friends. Calyx and Beau Schenecker were his greatest achievements; young adults who epitomized love, courage, honor, and citizenship. Calyx – the artist and runner. Beau – the soccer player and Future Business Leaders of America leader. Both – bright futures ahead. Wise beyond their years, Colonel Schenecker spent his personal time immersed in his children’s and their friends’ lives and various activities. Colonel Schenecker’s focus after retiring from the Defense Department has been on youth development in the Tampa Bay area through a Leadership & Ethics Speaker Series focused on Middle School students and through scholarship for leaders, artists, and athletes. After 30+ years in government service and service to his community, this great leader, role model, and Dad has chosen to continue his commitment to his children and his service to society by joining the ranks of Total Courage. The GMC Athletic Department presented one male and one female athlete the Total Courage Character Award. 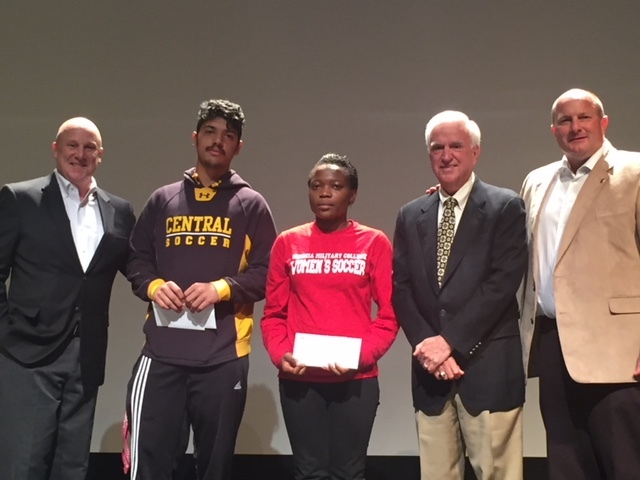 Ricky Ortiz a Men’s Soccer player and Sonita Mutang a Women’s Soccer player both were recipients of this award. Congratulations to both of them as they continue to exhibit the values and principles of living a life of character.